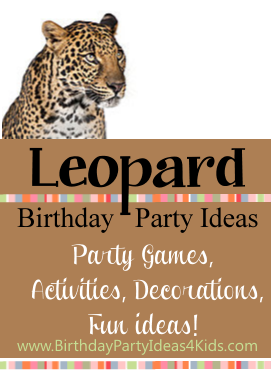 Fun Birthday Party Ideas with a Leopard theme! 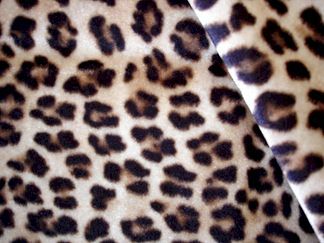 You can recognize leopard print by it's distinctive pattern - usually 3 colors with a dark "kiss" shape around the other two colors. Make your party natural leopard or try the new colorful leopard prints. Leopard print cards - use either solid leopard print on the outside or print out party information on a coordinating paper and cut smaller then the note card and paste onto the card. On plain note cards cut out a strip or bow shape from furry leopard fabric and glue to the front of the card. Buy white or tan balloons and fill them with helium. Draw on the leopard pattern with permanent markers and tie to the mailbox so guests can easily find the birthday party. Cut out leopard paw prints from construction paper and tape down along the sidewalk or entrance to the party. Decorate the leopard party with brown, tan and white streamers (or your favorite colors if using a colorful leopard print) or tulle in the same colors. Use leopard print down the length of the tables. Make a leopard banner by cutting out large triangles from leopard print paper and gluing the base of the triangles to ribbon. Cut out letters that spell "Happy Birthday _________ (name of your child)" and place of the wall behind the party table. Buy unpainted wooden picture frames at the craft store and set them out on a table covered with a plastic table cloth. Set out dishes of different colors and several sizes of sponges and brushes. Let the kids paint their own leopard print frame using traditional leopard colors or bright and bold colors in the print. Have several examples that they can use as guides and inspiration set out on the table. Use our homemade face paint recipes to make up a batch of leopard colored face paints. Then use sponges and paint brushes to make party guests into leopards complete with whiskers. Kids hold hands and stand in a line. During the game they must always hold hands. Name the person in the first spot in line the head and the last person the Leopard's tail. The head, while holding hands with the "body" of the leopard has to try and touch the leopard's tail. When they succeed then the leopards head moves and becomes he tail and the next child in line becomes the leopard's head and the game begins again. Hide plastic leopards, leopard footprints cut from paper, wrapped candy and/or leopard fabric swatches around the party area for guests to find. Give them a pair of binoculars or a flashlight for a night time game to try and locate the leopard items. Let the children keep the candy they find and have them turn in the other items for prizes. A Leopard Safari Scavenger Hunt is always fun to play at a party. The main idea of the scavenger hunt games is to divide into teams / teams race to find (or do) the items on a list. We have a great Animal Shelter Scavenger Hunt list that would be fun for a Safari themed party. Collect items around the neighborhood for your local Animal Shelter to help the "little cats" and have fun too! Free scavenger hunt lists to print out. Place a poster or drawing of a Leopard on the wall and put a piece of tape (double sided tape works the best) onto the back side of the Leopard spots that match the spots on the poster. Mark out the spots on the leopard poster that the guests will try to get their spots closest too. Blindfold one child and turn them around. Then show them the direction of the leopard poster. The child who pins their object closest to the designated spot is the winner! Set out an ice cream sundae bar and let the kids top their own sundae's with candies, fruit, syrups and chocolate and caramel sprinkles (leopard colors! ).